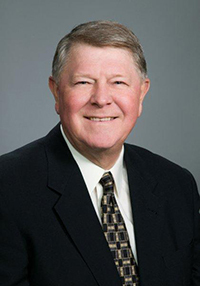 Mike Cadwell earned a degree in business with a minor in business education from Morningside College, and he has used that degree in various ways throughout his career. After graduating from Morningside College in 1969, he started his career as a high school teacher. After five years, he moved into retail business, where he spent seven years. For the last 38 years, he has worked in commercial insurance. He said there were several reasons why he chose to attend Morningside. During his time at Morningside, Cadwell played four years of baseball and one year of football. He was a member of the Delta Sigma Phi fraternity, and he played on intramural football and basketball teams. He said his favorite thing about Morningside was the size and the people. Cadwell’s advice to current students is to enjoy their time. He encouraged young alumni pursue their dreams while keeping a focus on relationships. “Get busy with your life adventure but don’t forget where you came from or the friends, acquaintances and mentors that you have connected with along the way,” he said. Cadwell and his wife, Linda (Johnson), who is also a 1969 Morningside College graduate, have three children and nine grandchildren. The have lived in Sioux City for 50 years – ever since their graduation. During that time, Cadwell officiated high school football for 17 years and high school and college basketball for 30 years, 20 of those being in the North Central Conference. Cadwell continues to play golf, and he and his wife enjoy traveling together to visit their children and grandchildren.